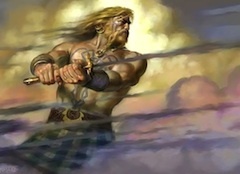 From what historians and archaeologists have been able to determine, the island that the Romans named “Hibernia” was a world so protected by fierce clan warriors that the emperors chose to stay on the larger island of Britannia and the European mainland. Few remnants of the Italian marauders . . . um, the proud Roman armies . 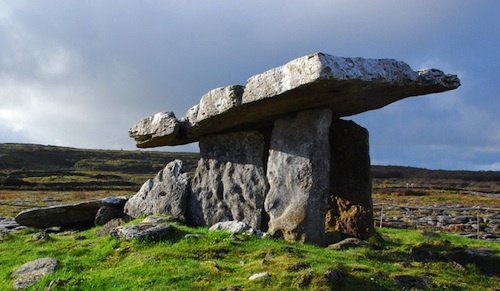 . . are found throughout the island that its inhabitants proudly call Éire. Why did the Pontiff choose Patrick? It is a matter of historical record that as a youth, Patrick himself had been taken from his home somewhere in Britannia—possibly Wales, or even Scotia—by a band of freebooters or pirates and taken to the island called “Hibernia.” He was about 16 years old, a pious young fisherman whose father and grandfather before him had been priests. Once in Ireland, probably in modern County Antrim, he lived in slavery for six or seven years. Once taken, Patrick was sold to a clan chief, supposedly a druidic high priest. Patrick became both his lowly shepherd and possibly even his unwilling acolyte. In those several years, the young man learned the language and the beliefs of the druids—both of which would stand him in good stead much later, when he returned as a missionary. According to his own published Confessio, Patrick lived among the people and spoke to them every day of the man named Christ. He says that he prayed to God hundreds of times every day, trying to maintain the utmost humility and love, even for his captors. “The savages stopped in their tracks. They exchanged looks of wonder at the strange young man on his knees, laughing and smiling at their imminent attack. “Slowly, they lowered their barbed spears and talked among themselves. I continued me prayer, for I understood not a word of their gentle conversation. “At last, two of them seized me, one on each arm, and dragged me to the water’s edge. One of the oarsmen reached over the side and hauled me into the currach. Thus I became an unwilling passenger on what turned out to be a slave ship. . . .
“I spent the next few days in ropes, alternately praying and vomiting, while the vagabond slavers made their way back to the Isle of Hibernia. Returning to what we know of his life… Patrick finally managed to escape on a boat that was bound for Britannia. After his return, he studied to become a priest somewhere in Gallia (modern France) and served as parish priest somewhere in Britannia before being called to Rome. He recounts, again in his Confessio, how he was convinced in a dream to return to Éire, for he heard the children calling. Whether or not one believes in miracles, the outcome of this dream is one of the astonishing facts of history. For the lowly priest not only returned to convert the “children,” he lived a long and productive missionary life in Ireland and was beatified some centuries later as Saint Patrick. 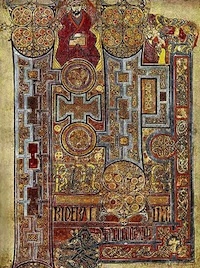 The Book of Kells, dating from the 9th century, is a direct result of Patrick’s insistence on re-copying and preserving the scriptures. If one can differentiate the legends from the facts, it is safe to say that Patrick sent for scores of bishops and other priests to join him in Ireland, and that he insisted the ancient scrolls and scriptures be brought with them, copied and protected. This dedication to ancient learning is what “saved” the world from the dark ages of ignorance after the retreat of the Romans in the fifth century. Thomas Cahill’s best selling book How the Irish Saved Civilization is a great one to read in this context. The brothers O’Cahan lived some ten miles north of Limavady, near the mouth of the River Bann. . . I gathered it was near a settlement called Cúil Raithin, or Coleraine, once visited by Father Patrick himself. Brion told me how his own grandfather, a chieftain, had offered Patrick a portion of land near the river overgrown with great ropy ferns that had to be burned to the ground each year. After Patrick left, the residents then adopted the name, meaning “ferny backwater” . . . This was not the first folktale I had heard about Father Patrick in the northern part of this island. I began more and more to realize that Patrick’s influence was beginning to be felt in many places besides Armagh, even if he had never set foot near most of them. Every place name in Ireland bearing the root word “kell” or “kil” can in a sense be traced to Patrick or his later followers, because it means “church.” And St. Patrick’s day has become a celebration not just of the man, but of Ireland itself. Patrick has put his stamp so firmly on the Emerald Isle that to think of him is to think of that charmed place, no matter what may be one’s religious denomination. We are left to guess at what Ireland would be today if an intrepid priest named Patrick (“patrician one”) had not set his sights on converting the inhabitants to Christianity. But it hardly matters. Once Patrick entered Ireland, the charismatic bishop set about changing the entire religious life and world view of the people. 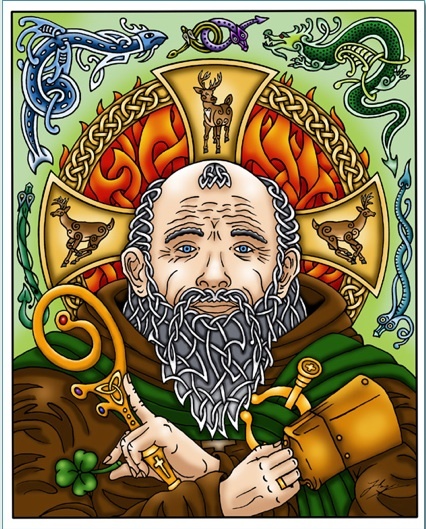 Here, in an ingenious portrait of the saint by Hamish Burgess, we see the various symbols associated with St. Patrick: the tri-partite shamrock, the banished snakes, the gentle deer. The fanciful halo shows a kind of crown of thorns, possibly the paschal fire he set in defiance of High King Leary in 433 AD. Note that this image shows Patrick’s hair as it probably was worn—in a tonsure. This fantasy tale centers on the magical-real journey of a young girl. Caylith—sixteen, self-centered and spoiled—returns from a trip to find her ancestral villa destroyed and her mother missing. In a state of shock, she and her best friend Brindl are taken to an unlikely refuge, a land she had thought existed only in fairy-stories. Fantasy for all ages (13+). The second in a series tracing the demise of magic in a new world being shaped by powerful forces, in the person of chubby-cheeked St. Patrick and in the improbable guise of Caylith herself. Book 2 of The Twilight of Magic (following Running Over Rainbows). A tale of tempestuous romance and blazing fervor in the Ireland of St Patrick. The smoldering flames of Christianity that Father Patrick is beginning to light across the landscape of Old World Ireland, culminating in the famous Easter fires of 433 AD. And there is yet another fire quickening, this one a surprise, revealed only at the end of Erin O’Quinn’s smoldering second novel in The Dawn of Ireland trilogy. ‘ST.PATRICK’ © Hamish Burgess 2012. Original Celtic and folk art by Hamish Burgess, a piece for the cover of The Celtic Connection newspaper in Vancouver BC and Seattle, the March issue. Erin, thanks for the lovely post. My oldest son, Michael Ahern, was born on Saint Patrick’s Day in 1982. He’ll be 31 on March 17th. One of my all-time favorite books as a kid was the Landmark biography, Life of Saint Patrick. Thanks for taking the time to leave a few remarks, Margaret. In my novels from both “The Twilight of Magic” and “The Dawn of Ireland,” I gave the heroine Caylith a birthday of March 17 also. Thus she would never forget that remarkable man who became both her mentor and her friend. He has been at least that much to me, also, even though I am far from religious! As always, fascinating. Thanks, Erin! Such a comprehensive history, Erin. Very enjoyable reading. Enjoy the day that’s in it! Happy St. Patrick’s Day, Erin. Loved your post. Lá sona Naomh Pádraig ó Éirinn! To each of my friends who took the time to stop by, I am grateful to you, and I wish each of you the blessings of St. Paddy.